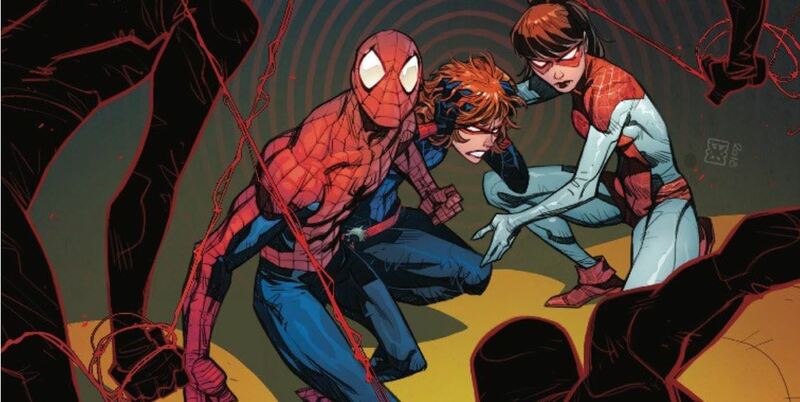 Amazing Spider-Man: Renew Your Vows #22 Review – AiPT! Rest assured, this is much more than just another clone or Goblin story. It’s time to cherish every moment, as what we now know to be Amazing Spider-Man: Renew Your Vows‘ penultimate issue hit stands this week. In the last issue, we were presented with a plot that wasn’t necessarily mind-blowing, but was used as a vehicle to drive some great character development, particularly honing in on Mary Jane Watson’s history as a mother. In the current issue, it seems we’re going to get some more insight on the “evil replicas” of the Spider-Family and what Mr. Sinister intends to do with Normie Osborn. The book begins by having the Spider-Family try to get some intelligence on the crazy Spider-doppelgangers that have been after Annie (and by extension, her parents), in the last few issues. When Annie realizes that Normie was looking into whether his grandfather’s cloning technology could be behind it and is now not responding to her, she smells a rat and our heroes jet off to Oscorp offices. The rest of the issue is pretty straightforward: the family arrives at Oscorp and is immediately accosted by their newfound enemies, with an evil bulked-up replica of MJ added to the mix and soliciting some humorous insights from Spider-Man. Eventually, the aftermath reveals that this is no “clone saga” after all, and this is supported by Sinister’s comments to Normie earlier in the book. We end the issue seeing what Sinister’s true motives are, and if this is setting up Renew Your Vows‘ finale, I have to say that it’s certainly wasn’t what I expected, but interesting nonetheless. I am insanely curious to find out how the final issue is going to set up Annie as she is presented to be in the intended followup series, Spider-Girls. The issue was clearly heavily focused on action and driving the story forward, which is a bit of a contrast from the last issue, where it seemed the primary focus was on character development. Here, it seems to be flipped, suggesting sometimes the story has trouble finding that perfect balance. However, that’s not to say that we didn’t get some great character moments in spite of this. Houser doubles down on wisecracks, particularly through Spider-Man. In spite of the seriousness of the situation, the jokes and humor never feels out of place and ties into something Peter once said in an issue of Ultimate Spider-Man: “Well, it’s either that I crack jokes or pee my pants.” The scene where Spiderling’s parents playfully grill her right before the major climax of the issue is timed perfectly and is a great example of this. One other thing I caught was a cool scene where Houser has perhaps injected some meta-commentary on the series coming to an end, hiding behind a humorous sequence about how Peter had a “dramatic” montage planned but was abruptly cut short, yet hopes to still do it “someday…”. Seems like more than a coincidence to me! Houser also makes sure that despite the plot trajectory being relatively straightforward and with only so much that can be left open with the end in sight, we still get some twists. These revelations in particular do a nice job by subverting our expectations and having certain mysteries turn out to be real nothing-burgers. Arguably, this could be a bit disappointing, but she makes sure to balance this by having a great surprise at the end (referenced earlier). The one pet peeve I have is that the lack of attention to the setting (whether location or time) continues to be an issue; in the opening scene the family pops into their apartment to use a mapping app, and then they head back out for action after just a few minutes. This seems odd not only from a timing perspective, but also from the perspective of the story being set in the future where you would expect some kind of technological advancement. There are a couple of splash shots and even half splash shots throughout the issue that allow Koblish to show off his workmanlike skills; while he will never be Alex Ross with his somewhat geometric, blocky style, he ultimately helps Houser drive the story forward. There’s one scene in particular where he shows Mary Jane taking a punch that bloodies her mouth. It’s a pretty intense moment because we’ve never seen MJ bloodied before in any continuity, and in fact we rarely if ever see Spider-Man bloodied because of his face being fully covered. Koblish not only captures the moment but shows MJ realistically dealing with the impact of the blow, continuing to tend to her injury a few panels later even after the fight has ended. Renew Your Vows has stood out from similar stories done in the past because of its ability to balance the fun-loving nature of a family book with a sense of darkness and grittiness. It looks like we are right at the final issue, which is a huge shame, but Houser and Koblish have maneuvered the characters and plot to ensure that this two year jaunt is going to end with a bang. Renew Your Vows has stood out from similar stories done in the past because of its ability to balance the fun-loving nature of a family book with a sense of darkness and grittiness. It looks like we are nearing the final issue, which is a huge shame, but Houser and Koblish have maneuvered the characters and plot to ensure that this two year run is going to end with a bang. There are some awesome wisecracks from Spidey that help defuse some tense moments and even serve as meta-commentary in one case. The plot subverts expectations by choosing not to rehash two previously done storylines (in numerous continuities) and throwing us for a swerve with the ending. Shots of Mary Jane being bloodied up in combat end up being more powerful than you would think. In the opposite of the last issue, this time we have very little character development and more action, suggesting the book has challenge balancing both. The family popping back to their apartment for a few minutes just to use a computer seemed weird, especially for a story set far into the future.